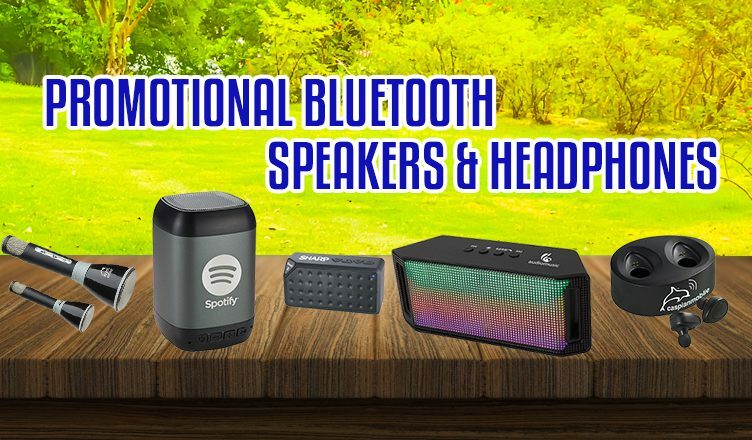 6 Classy Promotional Bluetooth Speakers and Headphones For Your Brand! Not many people know that Bluetooth technology has been around for more than 20 years. The initial euphoria associated with the introduction of Bluetooth technology may have died down but people still depend on it as a convenient wireless alternative to transfer files at homes or within a small radius. Today, billions of gadgets provide users with Bluetooth connectivity. And thousands of Bluetooth-friendly gadgets are being manufactured or sold this very moment. Count on this technology to remain relevant for years to come! Featured below are some of our gadgets that are definitely worth your attention! Some of them come with our 24 Hour Rush service, which means we ship the product the next day after you place your order! This product has a Bluetooth working range of 10 meters. It comes in a microfiber pouch that ensures quality convenience while carrying this product around. There is a built-in mic button to make calls and control music. The earbud has a user-friendly design that sits comfortably inside the ear. This speaker plays awesome sound from a Bluetooth-enabled device or through a 3.5mm audio input. It is compatible with all devices and can serve as an able entertainment companion! It features rechargeable Lithium-Ion batteries and is made of ABS Plastic. This speaker offers crystal-clear sound and comes in a prism aluminum case. Featuring bass enhancement, a microphone for conference calls and music controls, this product is a must-have! This speaker allows you to enjoy up to 2 hours of music at max volume on a single charge. It comes with a USB to Micro USB charging cable and a 3.5mm audio cable. This product comes with a base battery and a gift box. FCC Approved and compatible with most devices, this product offers amazing sound quality. It should be charged before first use. This wireless speaker features Echo Reverb sound for an amazing audio experience. Users can sing their favorite songs by using any karaoke app on their cell phones. Made of durable materials, this product comes in a black box. This wireless speaker features a built-in microphone for easy hands-free calling. It features light cycles with colors such as blue, red, green and white to the beat of the music. The Mode button gives you the option to choose from the hands-free phone, FM radio or auxiliary mode to connect with any electronic device. A preset playlist can be created and the device offers up to 2 hours of quality play time. This product comes packaged in a good-looking gift box. Place an order directly or get in touch with us to get your hands on one or more of these gadgets! We look forward to personalizing your order soon! 7 Luxury Promotional Products For Cherished Clients!